Its power is "120 V A.C. 60 Hz 800W". Coffee can be ready within 4 minutes. 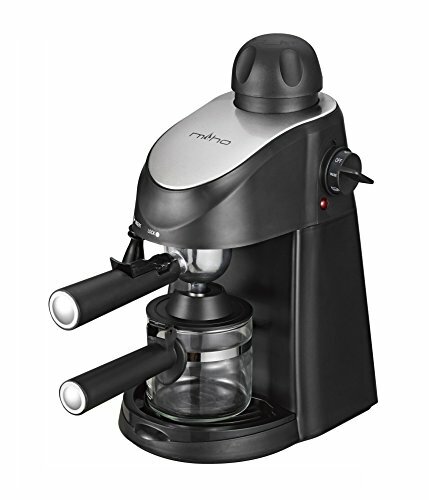 This espresso machine generates 3.5-bar pressure from water steam, other than 15-bar pressure from steam and a pump. Generally, it brews coffee with MEDIUM-FINE-GRIND powder. If you love much strong taste from EXTRA-FINE-GRIND coffee powder, before choose us, please have a look and cross-check on a 15-bar espresso machines. Before brew coffee (when you use it first time and/or you do not use it for a long time), please brew only water for several times to clean the water tank and water/steam pipes according to the instructions in the user's manual. Please do not put funnel into a dishwasher or otherwise you may damage it. A polarized plug (one blade is wider than the other) is connected as a safety feature, this plug will fit into a polarized outlet only one way. If the plug does not fit fully into the outlet, reverse the plug. Before use the coffee maker, please carefully read the user's manual. Please always following the Safety Instructions and Cautions in the user's manual. This coffee maker is intended for household use only. We warrant it against defects in materials and workmanship for one (1) year from original purchase date (hassle free to get refund in warranty period). If you need any technical and/or non-technical supporting, you may contact us anytime, we will reply you within 24 hours. 3 in 1 function: 3.5-bar pressure and high temperature of steam can produce thicker taste espresso, and make milk frothing for cappuccino and Latte. Velvety smooth espresso will make mornings so much better. Single switch knob with indicator light for easy operation; removable and washable filter for easy cleaning. Carafe has water level gauge; stainless steel filter has coffee powder volume gauge. NRTL certified as per national standards of ANSI/UL1082 and FDA: food safety, electrical safety, etc. are guaranteed. If you have any questions about this product by Miho, contact us by completing and submitting the form below. If you are looking for a specif part number, please include it with your message.